Last fall, I was talking to my grandfather at dinner, and he mentioned how his mother was also a great baker. I was very curious to know what kinds of things she baked back in Poland. My grandfather then told me about Kichlach. 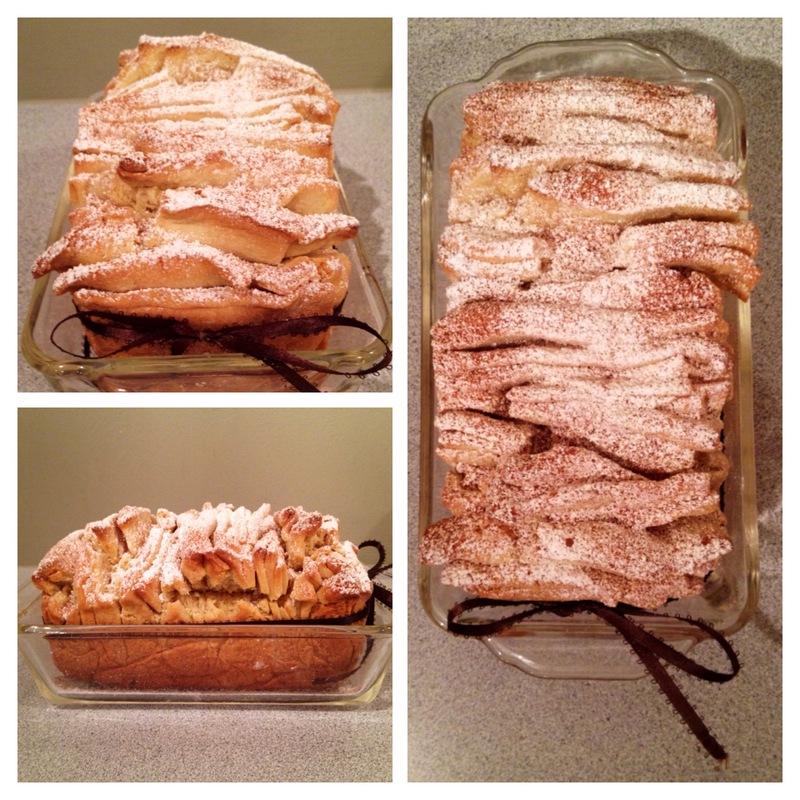 It is a cross between a cookie and a pull apart cake and is dusted with powdered sugar and cinnamon. He said his mother used to make it all the time and they would dip it in Hot Cocoa. I wanted to try and make Kichlach, but I did not have a recipe. I searched all over google, but all the recipes I found were recipes for Kichlach in cookie form, so I decided to experiment. 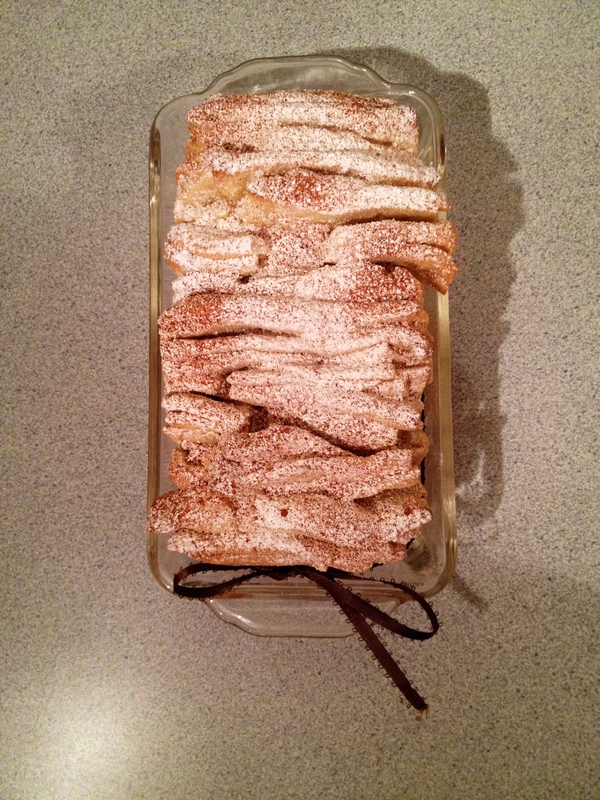 I combined the recipe for Kichlach cookies (give or take some extra flour), with the directions of a pull apart bread. It ended up tasting great, but I think the very middle of the cake was underdone and needed to be baked a little longer. Well, now I’ll know for next time! This Kichlach cake has many layers of light floury cookie dough and each layer has butter in between so it can easily be pulled apart. 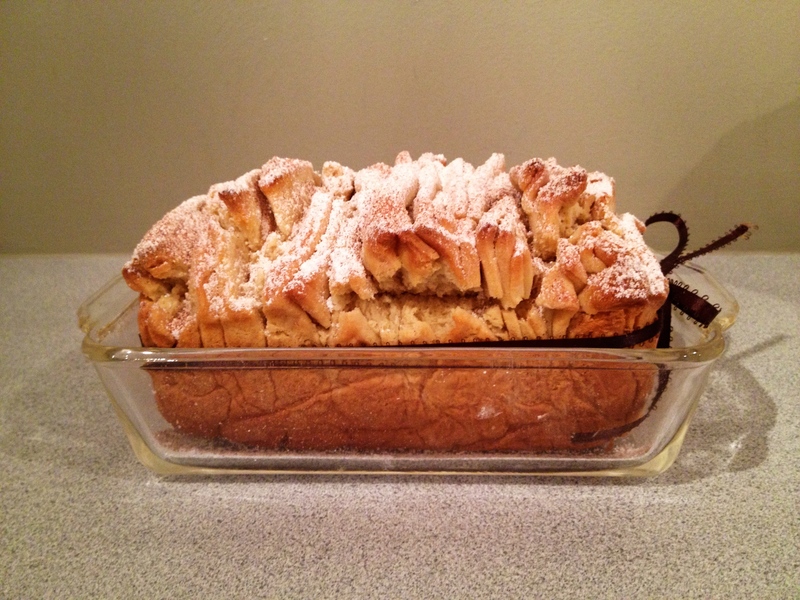 It is then baked in a loaf pan and sprinkled with powdered sugar and cinnamon. In a stand mixer, beat eggs until light, then beat in oil, sugar, 2 cups flour, and salt. The mixture should have a consistency that is firm enough to roll out. If it is still sticky, continue to add flour. Next roll out half the dough onto a floured surface until about a 1/4 inch thick. Now cover the dough with melted butter. Once covered, take a pizza cutter and cut the dough into strips that are about the width of your loaf pan. Stack these strips on top of each other, butter side up. Now take the pizza cutter and again, cut into approximate squares. They do not need to be perfectly even. Place the stacks of squares vertically into the loaf pan. Repeat steps 3-8 with the second half of the dough. Loosely cover the pan with foil, bake for 40 minutes, uncover the pan and bake for another 20 minutes. Test to make sure the cake is cooked in the center. Let cool, then dust the cake with powdered sugar and cinnamon. It reminds me of something form my childhood. Mmm. Looks absolutely delicious and flaky! This looks amazing. Intrigued by the cookie/bread texture. Thanks for the recipe – will try (not a baker at all so wish me luck)! Lovely story; will have to try your recipe.